The SPS is rolling out Stonewall’s No Bystanders campaign across the Service today, to coincide with anti- bullying week in the UK, encouraging staff to pledge always to challenge hurtful and hateful language and behaviour. Chief Executive of the Scottish Prison Service, Colin McConnell has signed the pledge and encourages others to do so with his message below. "When I was asked to endorse an anti-bullying and hate crime campaign across SPS, I felt strongly that it was the right thing to do. Bullying and hate are entirely harmful behaviours and can have a hugely damaging effect on our work environment and the people involved. They have no place in any part of SPS and it is important that we all stand together against it. All those in our care, staff, partner agencies and visitors have the right to be treated with dignity and respect at all times. "What do we mean by 'bystanders'? Bystanders are people who see or hear something happening and purposefully ignore it, choose not to take the appropriate actions or worse, think that someone else will deal with it. "Remember: What you ignore you permit. What you permit you condone. 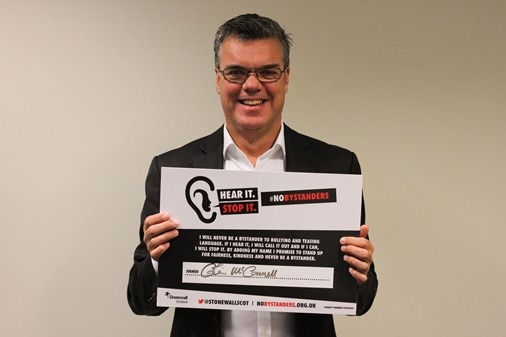 "The 'No Bystanders' campaign has a clear message: standing up for fairness and kindness against hateful language and unacceptable behaviour is everyone's business. No one must ever think that someone else will deal with it. It is not someone else's duty; it is yours and mine. Challenging any kind of derogatory or demeaning language or behaviour sets the tone for the type of culture we want to have in SPS. It gives strength to those who might be experiencing it but feel unable to speak up, and it sends a strong message of zero tolerance to those who might think about using such language or displaying such behaviour. "The 'No Bystanders' campaign is entirely aligned with SPS' Values and for this reason, I am proud to make a public pledge that I will never be a bystander. I encourage every manager and member of staff to do the same so that SPS is a place where diversity is valued and everyone is treated with dignity and respect." What is the No Bystanders campaign? I will never be a bystander to hateful language and abuse. If I hear it, I will call it out and report it, and if I can, I will stop it. By adding my name I promise to stand up for fairness, kindness and never be a bystander. Being a ‘bystander’ – standing passively by and not taking action when others are being discriminated against, harassed or bullied – makes us part of the problem. But we can also be part of the solution by challenging unacceptable behaviour whenever we see or hear it occurring. In doing so we can create a supportive culture for everyone. Keep an eye on our Equality & Diversity news page for further No Bystanders updates. Visit the Stonewall NoBystanders website here.